I FINISHED WRITING MY BOOK. This calls for celebratory lasagna and sparkles, to be honest, because my last WIP (work in progress) has been one of the hardest I’ve ever extracted from my brain. I finished up at 54,000-words in 8 days. Which pleases me greatly. If you want to read snippets, I posted about this disagreeable book earlier this week. Anyway. During this Week Of Writing, I read exactly zero books. Am I okay? Am I breathing still? Do I have a fever??? AM I GOING TO LIVE?? Who can know. My TBR dauntingly grew while I mentally elsewhere. And I accidentally totally on purpose bought some ebooks to reward myself for, you know, breathing. I’m hopelessly attracted to shiny new books. I love shiny things. I think I’m a shiny dragon. IT TOTALLY GREW WITHOUT MY PERMISSION. 9 out of 11 of these were surprise review-copies. That is a lot, okay?! I didn’t even library! (I was very adult and exercised self-restraint.) I shall be busying gnawing on these this week. Books make me so happy. ROGUE (Talon #2): I won it!! SIGNED. Also it’s so shiny and scaly and it has 1000% confirmed my inner dragon tendencies. I loved Talon so I AM EXCITED. FREEDOM RIDE: Thank you Walker Books! This is about Australia and racism in the 1960s. It looks a bit daunting, to be honest. THE SOUND OF WHALES: Thanks Scholastic! STONE RIDER: Thank you Penguin! Looks action-y, which is always fun. Plus Michael Grant (best author ever) blurbed it, so that is excellent news. ROYAL WEDDING (The Princess Diaries #11): I have never read a Princess Diaries book. NEVER. I’ve never read a Meg Cabot book. This was a surprise from Macmillan (THANK YOU) but will it make sense?? I’ve seen the movies. MOLLY AND PIM AND THE MILLIONS OF STARS: Thanks Text Publishing! Looks kind of cute, right?! WILD HEARTS (If Only #4): Thanks Allen & Unwin. This looks like the kind of frippy (that is totally a word, by the way) romantic dramafest that will send me to my knees, begging a dragon to eat my brain. SO. I’m not sure I’ll attempt it. (I haven’t the first 3 either.) My bad. BUT WHO KNOWS? Stranger things have happened. UPROOTED: Thank you Macmillan! I was excited but…it’s prettier than it reads, sadly. MAGONIA: Harpercollins had a sale on Amazon some of their newest titles being under $3. HOW COULD I SAY NO? I’ve wanted to read Magonia forever. A DARKER SHADE OF MAGIC: Also a sale. Under $2 on Amazon. (I saw it because the author tweeted about it.) And Vicious was sooo good, I just know I’m going to love this one. PAPERWEIGHT: This is about Mexico and eating disorders and death, basically. The cover is just hauntingly beautiful and oh, I have a total hand-bound ARC. I am so freakishly lucky. HELP ME DECIDE WHAT TO READ NEXT!! TUESDAY: What have I been up to lately? I talk about having a cold, writing a difficult book, getting chewed out online, and being obsessed with instagram. 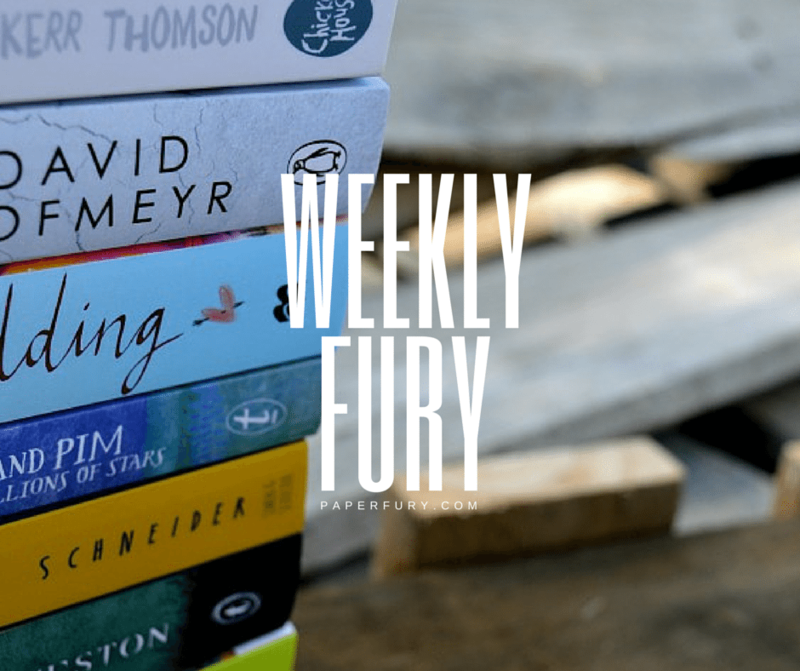 WEDNESDAY: My TBR is about to fall over and kill me, so here’s what I’m going to eat to stay alive. FRIDAY: I review The Catalyst (by a teen author!) which surprised me with brilliance despite a horrendous cover. SATURDAY: I talk about overlooked life-lessons like food before family and you should probably stab Caesar, that we can learn from books. Click on see Goodreads reviews! Click on the pictures to jump over to my instagram for bigger images! So LOTS OF THINGS HAPPENED RECENTLY. Let’s fangirl and flail as needed, shall we? Marissa Meyer is releasing a collection of short stories in February, 2016! So much happiness. Elizabeth Banks is in talks to direct the Red Queen movie! I’m not in love with that book and I feel like the time-of-the-dystopian is dying…but, hey. I never say no to an adaption. 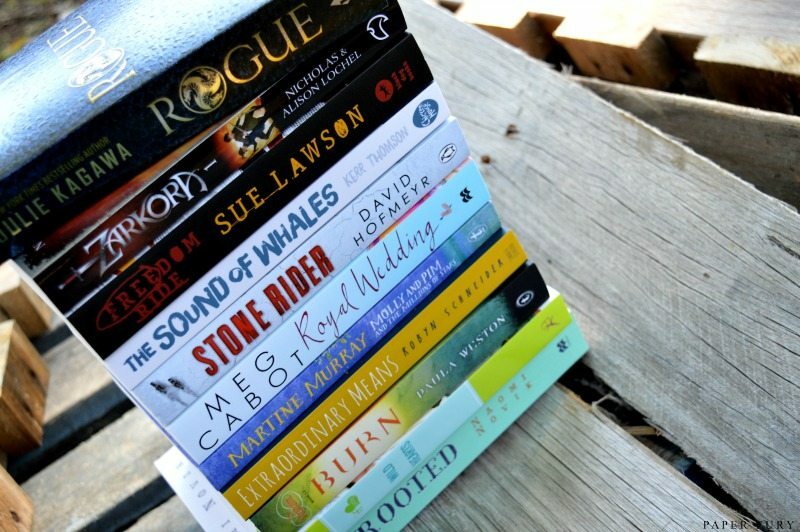 Epic Reads sums up YA parents quite beautifully. Here are pictures (!!) and details (!!) of the new Shadowhunter TV series as it’s started filming. Malec is adorable. Clary and Jocelyn are perfect. Simon is looking like a dork. Maggie Stiefvater and Cassandra Clare discussion how fandoms are hurting their authors and ruining the internet. Which is an incredible eye-opening discussion…people can be so cruel on the internet. MOCKINGJAY PART 2 TRAILER. CUE FLAILING. Shannon @ It Starts At Midnight talks about blogging slumps. Kara @ Diary of a Teen Writer discusses drafting processes. Emily @ Loony Literate talks about superpowers bookworms need. All of them. I want. Now. Alyssa @ The Devil Orders Takeout asks if we give series second chances? Beth @ The Quiet People asks where all the average protagonists are? YA appears to have misplaced them. Mel @ YA Midnight Reads has tips on how to get people reading your blog. Engie @ Musings from Neville’s Navel does a roundup of more fabulous #VeryRealisticYA tweets. I can’t remember if I’ve shared this before?? Eh. Read it again. It’s awesome. Kate @ Ghost Parties has tips for taking better instagram pictures. I’m quite relieved to be back into writing, and, because I AM ON FIRE (I am a dragon, remember) I’m tentatively planning to join in Camp NaNo in July! The cabins still terrify me. (I write alone, guys, I do.) So even if I don’t officially “sign up”, I’m thinking of sneaking back into fantasy, which is my old hunting ground, and doing a Russian heist and assassin novel. My pinterest board for it is my favourite thing of ever. Buuuut, my latest book also needs to be redrafted/edited/burned with holy fire because it’s so awful…so. ALSO! Don’t forget to enter my bloversary giveaways! They’re ending soon. And also last chance to win an ebook of Isla’s Inheritance from the author. Everything is open INTERNATIONALLY. And if you need a refresher on what the necklaces are…you can see them here on my Etsy store! I’m linking up with this meme: because it’s awesome. I just finished a WIP too. My first attempt at high-fantasy. Came in at a bit over 122,000 words. It was the hardest thing I’ve written–having to create laws, cultures as well as fit a solid plot and sub-plots in. But I wrote a few chapters of the sequel straight away, to keep my head in the game. I saw Jurassic World yesterday. Jurassic Park is my favourite movie of all time and the book is in my top five… And it was a damn good sequel. Stone Rider sounds wicked–may check it out. Congrats on your writing! I find it hard enough to juggle reading, TV and blogging with real life without throwing some writing into the mix! Hopefully you’ll get the chance to chill out this week with a good book! Enjoy your weekend! It’s totally nice just relaxing and reading this week instead of fussing over wordcounts. XD YAY!! I’ll be back into it soon though, for sure. I’m doing Camp NaNoWriMo! In April, I was invited to this cabin that withered and died. This time round, I got invited to a cabin that seems really active, and it is really useful – like having cheerleaders who appear whenever all the air goes out of you. 😉 I am aware that that sounds really weird. Just go with it. That is SO COOL you have a fantastically lively cabin though!! IT IS NOT WEIRD. It makes sense. Yay on the writing – That’s awesome! That is quite the stack of books. Love your pictures as always. And I am happy to see you liked Extraordinary Means – I really want to read that one. I read all the time while writing. It helps me take my mind off my story so that I can look at it from a new perspective. Creepy mystery magic story? I THINK YOU MADE A GOOD DECISION. Aww, thanks, though!! I think I might just be haunting twitter and probably instagram like I usually do though, because I’m such a hermit writer. >_< And everyone throws things at me because I write so fast. BUT I'M NOT CONSISTENT. It is a great failing of mine. So much here! Congratulations on finishing your book, I’m loving how it sounds so far. DON’T GIVE UP. You read more than me this week, and you’ve been busy, so be impressed, I’m so slacking lately.. I DON’T KNOW HOW I FEEL ABOUT BANKS DOING RED QUEEN. Granted, I would LOVE to see it on the big screen, but I watched PP2 and I though it was. iffy. Taking on a fantasy novel would be entirely different for her, and I don’t want it to get ruined with humour that shouldn’t be there, you know? Ugh, so torn, meh. I hope you enjoy eating all your books. I have book eating to do myself very soon. So many books..
AGJKLFDSA THANK YOU, AMANDA. I SHALL NOT! I’m actually planning to speed up my “rest” time. Usually it’s like minimum 6 weeks before I touch the book again, but BAH. I’m in a hurry, so I might be attacking it violently next week. *Gulps* I hope the second draft works better. heeh. I don’t know how Elizabeth Banks is as a director…I just love her as an actor. XD I’m kind of iffy because, say this does go into production…it can’t possibly hit the screen before 2 years. And even the Maze Runner will be ending. I feel like dystopian will be out and anymore movies aren’t going to do so well? BUT WHAT DO I KNOW. So many books. So much eating. READ. IT. In fact, start right now. Whatever book you’re currently reading, throw it out the window. This. Book. Is. Everything. It’s beautiful. Achingly so. Royal Wedding is so incredibly cute. Mia’s now 26, and even if you’ve missed that in between time between the last movie and now, you’ll still be able to pick up the storyline. Unfortunately Rogue and The Sound of Whales didn’t do much for me, TSOW I’ve put down for now because I just couldn’t get into it. But you didn’t read all week? I’m really shocked by that. You usually eat books by the hundreds. And congratulations on your new book! I’ve loved the snippets you’ve been posting. But the big question is, why is everyone writing books and not letting me read any of them? That makes me so incredibly frowny face. The Sound of Whales doesn’t even sound inspiring. :O I find I mostly die on Scholastic books, unless they’re by Maggie Stiefvater because OBVIOUSLY. LURVE. *ahem* OHHHH. I AM EXCITED FOR MAGONIA. I picked up Stone Rider and I’m kind of snorting because it’s a bit…weird, but lemme finish before I go for Magonia. Come now, Kelly. I don’t TOSS books. **Gasps** What do you think I am? A savage? I KNOW. It was most unusual for me to just suddenly not read for a week. But, ahem, I have like finished my years goals. Oh, well, I’m 2 books off, but STILL. We’re doing it on purpose, Kelly. We’re so mean like that. Congrats on finishing your book. You’re a writing machine! AGH that trailer! I wanted to cry when I saw Finnick and Annie <3 And I love that part where Katniss actually HUGS Peeta (without him trying to kill her) but it was also sad because Peeta looked SO SAD. Glad Effie is back to her crazy costumes. That was such a good trailer. OOOOH. I loved Red Queen and if Elizabeth Banks is going to direct it, you know it'll be great. I really hope this happens because I really do think it will make an outstanding movie. Can you imagine the ending? Maven? WOAH. I hope you have fun trying to get through your TBR pile and good luck if you decide to do Camp NaNo! In response to your worry about Royal Wedding I read the first few books YEARS AGO and was worried that I might not have any clue about what’s going on. But my fears were UNFOUNDED. Thankfully… There’s a fantastic newspaper article at the start of the book which basically catches you up on anything you need to know, but you won’t have any issues knowing what’s happening only having watched the films. Also, it’s hilarious. I can’t wait to hear your thoughts! It’s really upsetting about authors being abused by fans (I got slightly ranty about it in my Bookish Brits video this week) I can’t believe how some people think it’s ok to treat authors like this. The MTV interview followed by the whole John Green shebang made for some decidedly un-fun news. Your word count is INSANE for that length of time. And I have absolutely loved the snippets you’ve posted, much chuckling has ensued. OKAY PHEWF. That’s a relief for Royal Wedding! I didn’t want to just have to ignore it on the I-have-no-ideas-what-the-heck-this-book-is principle. I quite loved the films back in the day. XD Some incredibly funny lines. ERMAHGERD you have an ARC of Paperweight???? HOW DO I NAB IT????? So freakishly excited for that book. As for reading while writing, well…obviously I don’t read as MUCH. But writing is exhausting and sometimes I need to back to my sources of inspiration (which are often…um, books. Or the internet. Which explains the procrastination). I JUST ASKED. And the publiscist was all like “I’ll print it for you”. :O I felt kind of bad, but I feel super special. xD I go to pinterest for all my while-writing inspiration. And also watching TV. TV IS GOOD WHEN WRITING. AJFDKLA BUT THANK YOU!! Congrats on finishing your latest book, Cait! I am ever astounded at your speed in both reading and writing. How do you do it? I do not put books on hold while writing like you do simply because I can’t write novels as fast as you. Also, I am woefully behind on my Goodreads reading challenge. However, it is summer, and therefore, I SHALL READ ALL THE BOOKS AND WRITE ALL THE THINGS. I am so excited for Camp NaNoWriMo, and you should totally do that. I am actually a huge fan of the cabins and I wish the same format was used in November. I have some great cabin buddies and we are usually always in the same cabin. Our cabin is pretty active so it tends to be a ton of fun. I hope you find an awesome cabin if you decide to join one, but our cabin is always welcome because we have a few open spaces left. Why you read things so quickly?? I actually decided to buy Extrordinary Means (and got it yesterday) and have started reading it. Not too bad, but I’m not relating to the MC yet. This year will be my third CampNaNo (July) and I’ve never and am not this year planning to write in a cabin. High five for solo writings! Because November is the heart of my academic first term, NaNoWriMo is out of the question, so I use July as my NaNo. As my mind/ideas have been all over the place lately, though, I could probably do with some encouragement. I DON’T KNOW. I do everything very fast and very furiously, hence my blog name — except I couldn’t name my blog Fast AND Furious, because, well. I am not a car. I AM A DRAGON. *breathes scary fire* Ahhh, I hope Extraordinary Means gets better for you! I totally related to Lane and his over-working-never-resting-mentality. That was completely me in high school. XD And, basically, forever. I do not have an off switch. WOOT. There are like 3 of us going solo for July now!! HAHA. We are such hermit writers. I just want twitter and pinteresting and my word doc, and I’m good to go. XD I love November-version though, because it feels more…focused? WE SHOULD ENCOURAGE EACH OTHER ON TWITTER!! Woohoo congratulations on finishing Tremolo! The premise is simply wonderful and argh, I just want it so much. You are absolutely a dragon. AND READ ADSOM DO IT DO IT. I will never stop shoving this book in everyone’s faces. I totally feel you on writing during July but not doing cabins — IT INTIMIDATES ME. IT DOES. I think I’ll just hole up in my Twitter and Pinterest accounts and just write. 😛 ALSO MOCKINGJAY PART 2 EEEEEK. DID YOU JUST SAY CURIOSITY BONE? That is my new favourite phrase of ever. I think my bones suffer from this as well, to be honest, because I want to write and read all the things of ever. Where have my clones gone. I NEED THEM. Yaaaay congrats on finishing your writing, Cait! That’s seriously amazing xD And omg right? So clueless if Royal Wedding can be read without the first 10 or not. But I’m perfectly happy with the movies so I dunno. Shame that Uprooted wasn’t what you were hoping it to be 🙁 Looked promising. Also, HOW you manage to write and blog so much at the same time is actually beyond my comprehension. When I grow up I want to be you. And can I just say your blog actually gives me LIFE and I want to read every book you have ever written/will ever write. That is all. I KNOW RIGHT? MORE PEOPLE NEED TO SHARE THIS IMMENSE LOVE OF DRAGONS WE HAVE BECAUSE DRAGONS ARE THE MOST EPIC THINGS OF EVER. WE SHALL MUTUALLY LOVE OUR SHINY SCALY DRAGONS. I sooo hope Royal Wedding will make sense for me then. XD I like wit! But, yes, there’s that awkwardness of me not having read any of the books. Ohhh, but with the writing AND blogging. I get a week’s worth of posts ready to go. 😉 EASY. Since I write so fast. WHEN I GROW UP I WANNA BE A DRAGON. I HAVE READ VICIOUS AND ADORED IT SO YEAH. THERE’S THAT. haha, I still don’t think I’ve beaten your record, though, have I?! First, how could you write 56,000 in EIGHT DAYS?! I can barely write that in 30! And a possible Red Queen movie would be cool. Also, yes for Camp NaNoWriMo, I’m in a bit of a writing rut lately so I need that boost. And I think that it’s horrible how people treat authors. Like that think that happened with John Green where he was accused of sexual abuse on Tumblr, and people actually kept tagging him so he would see it pop up. It’s like people think since it’s unlikely they’ll ever meet the author in real life, that means that it’s perfectly acceptable to go and send hate mail or say an author doesn’t deserve the characters they created or even go so far as to force the author off the internet. It’s one of those things where people should think “Would I say this too his/her face?” And THEN decide what to send to the author. My record, so far, is 64,000-words in 7 days. XD bUT YEAH. IT’S A BIT INTENSE. To be fair, though, I basically do NOTHING but write in those 8 days. I ignore humanity and just write until my fingers drop off. And watch Elementary, because, let’s be real: a little bit o’ murder goes a long way. Ohhh, what’s your project going to be about?! UGH. YES. I saw that about John Green and it makes zero sense. That’s just like picking a random cruelty and slinging it at people. Haters are getting more malicious. 🙁 And it’s true! It’s like there are no consequences, right? They think they’re protected behind a screen and, basically, they are. But how can people not understand that bullying is CRUEL and WRONG no matter what method they go about giving it???? Uh, zombies. And animals. Zombie-animals. Basically, the plot is that humans have wiped out rabies a bit too effectively, so the disease has mutated. It no longer affects humans, but it’s infecting animals at lighting speed, and the animals are now basically invincible; short of a bomb or being torn to pieces, they can walk through pretty much everything. And if they’re not killed, they don’t die. It is stupid and heartbreaking and just wrong. What makes the thing with John Green even worse is that they wanted him to see it. They tagged him in it so he would have to see it. I guess the one good thing about it is tons of people have his back, other authors included. Congratulation on finishing your writing! It’s awesome since I never finished any of my writing xD Anyway, those stacks are cool! Hope you enjoy all of them! Congrats on finishing your book girl! That in itself is a huge accomplishment!♡ and I always love to come to your blog and see all of the wonderful pictures you take. It makes me want a real, physical book and not just one on my Kindle screen. (Never does it justice.) 🙁 and Mockingjay??? YAYYY! Physical books ARE THE BEST. Kindle is so handy (and sometimes cheaper) but nothing beats taking photos of a sold book. :’) MOCKINGJAY IS GOING TO HURT A LOT BUT I’M READY FOR THIS. I just picked up Every Last Word from the library and am very excited to read it. I’ve heard tissues will be necessary. I’m so nervous for Mockingjay Part 2 because I haaaaated the book, but so far the movies have impressed me. Well, that’s not entirely true. Mockingjay Part 1 made me want to take a nap, to be honest. I think Red Queen could make an awesome movie, but as I’ve said before, book adaptations make me nervous. I am excited for The Martian, though, which I just finished reading. Which reminds me, I should go watch the trailer now that I’m done! REALLY? MARAIA. HOW COULD YOU HATE THE MOCKINGJAY BOOK. OMG. CAN I EVEN TALK TO YOU ANYMORE. I read 2/3 of Every Last Words and it’s SO GOOOOOOD. I think it’s a “you” book. It’s definitely a “me” book. It was really hard to force myself to go to bed, and then I couldn’t fall asleep anyway because I couldn’t stop thinking about it. If you’re curious: I hated it because The Hunger Games was SO AMAZING and had so much potential to say something important, and then the Mockingjay was just such a cop-out. I don’t know if Collins was under pressure from a tight deadline or her own popularity, or what, but I will never be okay with it. The third book said nothing important, it was just LET’S KILL EVERYONE. I also hated that the love triangle issue was “resolved” by one guy backing out. I HATE that Katniss never made a decision herself, because I don’t think that fits with her character at all. I’m already over Dystopian movies, so I don’t know, haha. I wasn’t sold on the book, either, but I listened to the audiobook, which increased my enjoyment of it. That’s the book that really annoyed me with the modern slang. And the MOTORCYLE, what?? BUT I BINGE WRITE. And have no life while I write. Seriously. Hours and hours of writing. I get very obsessed about things. 😉 I so cannot wait for Magonia. It gets so many mixed reviews but the people I trust liked it so YAAAAY. Congrats on finishing your book. That’s awesome. I really need to get back into the habit of writing. I have an idea I really want to work on – I just need to figure some stuff out and then get started. I used to be JUST LIKE THAT. I would just end up using the book I was reading as too much of an influence. It can be a problem. 🙁 Hence I try not to read while I write, too. Unless it’s a comic. Because comics are just awesome and non-bleedery-ish (that is so totally a word). Did you like Cruel Beauty?! I quite adore that one!! Overall, I did like Cruel Beauty. I thought the ending was weak, but I loved the world-building! Congrats on finishing! That’s awesome. ARE YOU A DRAGON!? WHY HAVEN’T YOU TOLD US!? CAIT? CAIT. ARE YOU SURE YOUR A DRAGON? IT’S BEEN CONFIRMED. YOU ARE A DRAGON. It was so obvious, I mean you like shiny things. That’s a dead giveaway. “You’re not going to tell us are you?”….What if I bribe you with cake ans shiny books? IT’S TOTALLY OBVIOUS. I mean, if dragon’s like cake? I think they do. I’ve never heard an evidence otherwise. I could totally toast my cake with my own fiery breath. *nods* It’s the dragon in me that makes me write faster, tbh. OHH, THANK YOU. I’ll check out that tag ASAP! CONGRATS ON FINISHING YOUR BOOK! What a huge accomplishment! I had to forgo my writing this week to prepare for an oral exam that I bombed. BUT BACK TO WRITING I GO. Congratulations again for completing your contemporary and may I say those snippets that you posted were fabulous? I joined Twitter and like a complete fanatic, I immediately followed all of my favourite bookish accounts, ha. OMG. MEAN LIBRARY. HOW COULD IT BE SO CALLOUS?! I hope you get it back soon. xD I’m sooo excited for ADSOM. Rather than commenting on any of the MAIN points in this post, I’m going to go off of that one small sentenced snippet after Red Queen. Namely, I KNOW!!!! I feel like the time of the dystopian is dying, too, and I’m SO disappointed! I feel like it’s a genre I’ll never get sick of. Really?! THAT’S GREAT! I’m a bit burnt out of dystopian myself, but we are getting a few surprisingly unique and original ones sneaking through. Like I’ve just started Stone Rider and it’s dystopic (isH?) and SO unique!! HOW ARE YOU SO INCREDIBLY AWESOME, ABBIEE, ZMOG. I HAVE ONLY AFJDLKSADSA WORDS IN MY BRAIN RIGHT NOW. THANK YOU. AND ZOMG. :’) :’) I seriously tried writing a serious book. I gave up after a while because not working. And I will never ever be sorry for being a bad influence on your ALLCAP USAGE. Seriously. Life without all caps is no way to live. YOU ARE A DRAGON? Ok then hahaha. But congrats on finishing your WIP! That’s an awesome accomplishment! I accept the fact that you are a dragon yes yes. There’s the whale book again! oh and I also have Royal Wedding! But never have read the Princess Diaries series, so I don’t know what to do. Are you going to review it? I AM. DON’T DOUBT ME IN THIS VAL. *nervously doubts self* But ahhhh!! THANK YOU. I think I’m going to read Royal Wedding?? Like idek anything about Princess Diaries except from the movies. If it doesn’t make sense I’ll just not read it, but I WILL TRY AT LEAST. ZERO books?! ARE YOU OKAY?! I know CPR (sort of)! Also, read A Darker Shade of Magic! I need to read it, too, actually… Inhale it and proceed to review it, I need your thoughts! And from one dragon to a fellow dragon: RAWR. *rawrs dangerously back at you* I am rather terrifying OF COURSE. A terrifyingly adorable dragon. Just sayin’. AND NO I AM NOT OKAY. I ATE LIKE 2 BOOKS IN A ROW YESTERDAY AND AM STARTING TO FEEL BETTER. Of course, of course! And don’t forget awesome! I would suggest a large dose of books IMMEDIATELY! You still have time to reverse the damage! *eats books copiously* YOUR ADVICE IS SOUND, DOCTOR. What an eventful week! !I really want to read Uprooted. EVERYONE loves it. And so shall I. Maybe. I think you should read ADSOM next, everyone really enjoys that one too 😀 I’m so excited for the Red Queen movie! Marissa Meyer is a queen, I can’t wait to read her short stories. That MJ2 trailer looks EPIC, I NEED IT. Happy weekend! OH MY GOSH CONGRATULATIONS ON FINISHING YOUR BOOK 😀 😀 😀 that’s so great, I’m so happy for you ^^ and wowzas you got surprise review copies?!?!?!? That’s so cool 😀 😀 :D! IT’S LIKE CHRISTMAS IN JULY. WE SHOULD ALL EAT CHRISTMAS CAKE. 9 surprise review copies? O_O Wowness. YUS LOTS OF BOOKS. HELP ME, DEBORAH. I DROWNED. Although, it is helping my ploy of making an igloo of books and then living in it. *whispers* That’s probably my new life goal. Book igloo. WAIT. Maybe book castle?? Can I be a dragon and live in a book igloo?? I AM GRAND AT FORCING PEOPLE TO DO STUFF. YAY I CANNOT WAIT FOR YOUR COFFEE POST. I AM A GOOD INFLUENCE. I AM. DON’T DENY IT. I CAN DO ZAT. I Can breath ice instead of fire. (Did I tell you I’m writing an icy-dragon book at some point?? I can totally star in my own book.) And breathing icing would be further useful. Although ice could be cool, because I could keep a private supply of ice cream cold at all times. Have fun being a dragon! Whats your dragonly name? I don’t know what mine would be… I think I should come up with one for myself. That’s very important. Wordy words makes 1000% sense. THAT IS ME. I like words, but I like them thinly. AWWWW. :’) Well I think some will go up on wattpad?! MAYBE. It’s quite catastrophic right now but I’m planning on working on it soon. It is very important, but I’m hopeless at names. I considered Toothfull, because, well, I do have teeth. And then perhaps Smog since Smaug is taking. Or maybe I’ll just be called Crumpet and then everyone will go “Awww, such a tame dragon!” and I shall eat them and surprise the world. *nods* Although eating people might have bad repercussions. Idek. Jury’s out. Awesome post! I can normally write and read at the same time (well not simultaneously same time, but you get what I mean, lol. It would be cool, though). AND YES THE MOCKINGJAY TRAILER. I WANTS IT! I NEEDS THE PRECIOUS! I can’t believe I have to wait until November to see that movie. And congratulations on finishing your book!!! 8 DAYS. Wow that is amazing! SIMULTANEOUSLY WOULD BE GREAT. haha. Ahhh, but you are talented regardless (though, ya know, when you learn how to do it simultaneously I’ll be bowing to you). The Mockingjay 2 trailer… thank you. Thank you for allowing me to watch it again. It is just… feels, okay? FEELS. I mean, dancing with Prim?! Freaking FINNICK at the end there!? And the WEDDING!? And Peeta being beautiful… I simply cannot handle it all. I can’t. I want the movie but… then it will be over. And I don’t think my fangirl heart can cope with that. So sad about you not liking Uprooted! I had been so very hopeful for it. HEY- if it is like The Sin Eater’s Daughter, maybe I will like it? 😉 Totally agree about Extraordinary Means too! 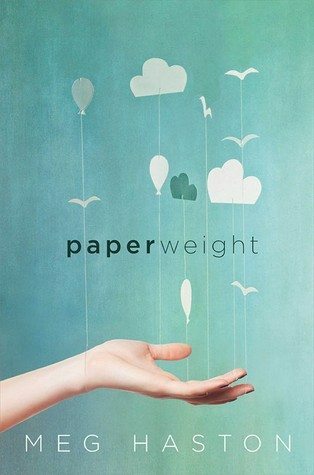 OH- I voted for Paperweight, really because I am starting it tonight and we could share opinions! No Camp NaNo for me, sadly. One of these days. I hope. I am sad about it, but I really think I would be even more sad if I let what happened in November happen again, and just completely fail. MORE BOOKS THAN ME. WELL THEN. *ups game for next time* And yes yes you’re welcome. I’m just going to keep reposting the trailer and forcing us all the refeel the feels. HOW ARE WE GOING TO MAKE IT THROUGH THIS? *cries because unfair torture* Peetaaaaa. PRIM. I shall be on the floor in a puddle of tears if you need me. And Magonia is SO AWESOME! I loved it. MOCKINGJAY TRAILER OH MY GOSH I AM SO EXCITED! And am preparing for many tears. That movie is going to destroy me. My week was just end of exams and lots of reading. And speaking of reading, if An Ember In The Ashes is not on your TBR then WHAT ARE YOU DOING?? So good, and the cover is SOOO PRETTY! CAIT YOU ARE TELLING ME YOU GOT THIS MANY BEAUTIFUL BOOKS IN ONE WEEK. I am in awe at all these beauties, YES PLEASE! A shame you didn’t enjoy Uprooted as much as everyone else, I was really looking forward to that one. I can’t wait for you to read Magonia though, I read it recently and adored it! Really great weekly post dear! Probably a bit over a week?! I THINK. I can’t even remember. xD It’s been a while since I did a StS post though, so they’ve been accumulating since then, lol. I’m super curious to know if you like Uprooted. Will you be reading it any time soon?? I need to read A Darker Shade of Magic! Read it and poke me to read it too! *pokes you* COME NOW, NIKKI. IT CALLS TO US. I loved the article about fandom with Maggie and Cassandra. It was so good. I always feel for authors when I see their fandom going crazy, especially when you see them hating on the author for the film choice. I saw people doing it to John Green a few weeks back about the Looking For Alaska movie. The Mockingjay trailer looks awesome, though I can’t believe it’s almost over. It doesn’t seem like it was that long ago that I was rushing to read THG before the first film came out. And it was THG that really got me into YA, and encouraged me to start blogging about books, so I’m kind of sad to see the film series come to an end, even though I don’t think they’re that amazing. I might to Camp NaNoWriMo; the past couple of months I’ve felt a story building inside me, and I feel like I need to start getting out it. I’m sure it’s another one that I’ll never actually finish, but I feel like I need to at least get it out. I’m like you, I can’t read really when I’m writing. I find things get muddled up, and when I’m in writing mode, all of my attention and creativity is on writing. Okay, I just read that discussion between Stiefvater and Clare and- Wow. Just wow. 1) I didn’t know people could be that cruel over books. 2) I didn’t know people could be that cruel period. 3) WHY CAN’T WE ALL JUST GET ALONG? 4) That’s almost scary. 5) I love how these women are standing up and talking about it though. It keeps ignorance down. 6) I agree with both of them. But I’m a little more like Stiefvater: That’s what I think. If you don’t like it, then too bad. Go think something else. 7) This is a really long list but the contents of this article really disturb me. The way people act, really?! 8) I’ve never really considered authors as anything other than human. I mean, I think they’re amazing, yes. But are they super-human? No, they have failings. They have bad days. They need an encouraging word sometimes. Is that weird? Or is it just because I’m a writer, that I have this knowledge, that hey, we are not a brick wall- you can’t throw things at us and expect us to be invincible. Anyways, I don’t understand why people within a fandom argue about things. So someone disagrees? Big deal. That doesn’t mean you have to be hostile. It should generate friendly, MATURE discussions. Not arguments. I feel like, as writers, we do think more about the author behind the book. I feel like some people must just be so beyond clueless about it. Which scares me. Imagine thinking YOU know better than an AUTHOR about THE AUTHOR’S WORLD????? Like. What. *shudders* It shouldn’t be a big deal. There should be cake and sprinkles and love. People shouldn’t get violent over fantasy worlds. GAh. LET’S JUST THROW CAKE AND GLITTER BECAUSE IT PROVES HOW FABULOUS WE ARE. *tosses things of gloriousness* And I’m probably coming down with something…a bookless fever??? I’m sure that exists. *nods* FINISHED SKULDUGGERY. YOU BRAVE THING. Hey Cait, we all have weeks where we don’t read. Just pretend you had a bad cold and could only manage to lift your weakened fingers to edit and eat cookies and that was it. But seriously (you don’t know how serious I am), off weeks are normal. Don’t feel bad- you read so much in general. Sometimes a break is really needed! That is so totally true. It was ALL I COULD DO to eat those cookies and write a few words. *feebly types* I’ll totally spin it better next time. I shall take my lessons from YOU, Romi, you incredible thing. Ahh, finishing drafts definitely excite me!! *dances* It’s a step towards having something that’s nearly socially acceptable to read. YAY. AWww, I shall let you know when it’s in acceptable shape! Well I just finished editing mine up a couple of hours ago (endless squees), so I totally know the feeling of having a section done. And now I’m going to be entering an agenting competition so it’s endless anxiety and excitement mixed. And in the middle of my holiday, too- I time these things badly. Yay! You finished congrats! 😀 My week has a been cousins over and lots and lots of editing and drawing lol. XD THE MOCKINGJAY PART 2 TRAILER IS SO FREAKING AMAZING! I’VE WATCHED IT LIKE FIVE TIMES AND SAW IT IN THEATER WHEN I SAW JURASSIC WORLD!!!!!!!!! I had a brother and his wife over and was writing as well, so BUSY TIME FOR BOTH OF US AMIRITE?! Ohhh is Jurassic World good?! I’ve heard it’s doing so well, and also CHRIS PRATT IS INCREDIBLE. Congrats on finishing your book!! That is an AWESOME accomplishment!! YOU ARE MY FAVORITE BLOGGER ATM!! Seriously, your hard work shows with these posts. I’m sure this takes you A LOT of time! I love it!! Your instagram is gorgeous as well.. how do you do thissss? hahaha I tried, but failed. I WILL READ IT!!! I WILL!! I have to get through a few ARCs first *glares at TBR* and then I’m going to devour it because VE Schwab is amazing. *happy sigh* I think I’m in the minority for my Uprootd glares, though. So maaaybe you’d like it?! *whispers* My page stats have been down too! I think all the Americans are being outside or holidaying? WEIRDNESS. Someone chain them back to the computer. ZOMG YOU GOT A REVIEW COLOURING IN BOOK??? I waaaaant. I wish Aussie publishers did that because I would be so onboard. hehe. Ah yes, Atticus should really make a reappearance. *nods* Next week!! OH MAN please write a Russian heist novel and post it so we can read it because your pinterest board about made me swoon! I love books with Russians in them and I need it. I absolutely NEED it.